Katherine Yang has been out to her parents since she was in high school. Although it was difficult, she felt relieved once she told them. “I didn’t want to masquerade anymore about being someone I’m not,” says Yang, 28. And once her parents knew, it was easier for her to be open with others. Although her parents had a hard time at first, she says they grew to accept it. Katherine Yang at last year's Gay Pride Parade in Honolulu. Hope for the best, but be prepared. Don’t expect your parents to be OK with it right away. Hopefully, they’ll eventually realize that you’re no different from anyone else. Time heals. Give them time to react and process the news. 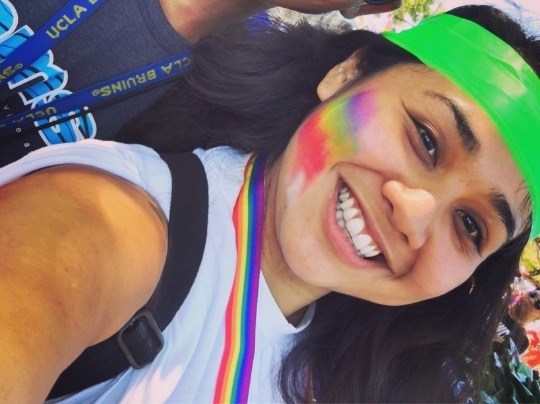 Coming out is not for everyone, says Keith Pedro, Psy.D., a Honolulu clinical psychologist. Each person must decide if or when to come out based on their comfort level and relationship with family and friends. He adds that in some cultures, coming out or being pressured to share one's identity can cause stress. First, talk to someone you trust and can confide in for support—whether a family member, friend, or professional therapist. “It can help alleviate some of the anxiety and stress,” Pedro says. Just as it’s hard for children to come out to their family, it’s hard for parents to accept the news. Take Annie, for instance. She marched in rallies to support gay rights. But when one of her sons told her he was gay, the reality hit too close to home. Annie was worried about not having grandchildren and the social stigma he may face in society. She was confused and became so stressed that it affected her physical and mental health as well as her work and marriage. But after going through therapy with a psychiatrist, she's now come to terms with it. She hopes he’ll one day get married because she says, “life is better when you can share it with someone.” She’s even thinking about what kind of dress she’d wear at his wedding. “You should love your kids no matter who they are. They should have the same rights as everyone to feel safe and loved,” she says. Be understanding. Realize that it takes courage for your child to come out to you. Be grateful that your child feels comfortable enough to open up to you. Keep an open dialogue. This is particularly important if you notice your child may be depressed. Give yourself time to process the news. Be honest with your feelings. Don’t be afraid to get professional help. Find a counselor who you feel comfortable with and can understand your emotions at a deeper level. Talking to family and friends may not be enough.